I just returned from the lecturing at the World Small Animal Veterinary Congress on Jeju Island in South Korea. It was a joy to reconnect with old colleagues and friends throughout the world. I saw veterinary friends from South Korea, Japan, Hong Kong, Singapore, Thailand, Australia, New Zealand, China, as well as from the U.S. and Canada. It was fascinating to hear from them about all the changes over the past few years in each of their countries amidst all the environmental, economic, political, social and conscious events of the past few years. One story that was common throughout all the discussions was how essential animal companions had become in the midst of the massive shifts and changes throughout the world. 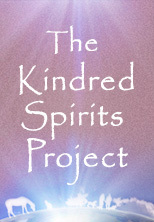 The unconditional love shared by our kindred spirits was becoming even more vital to help support the human soul as we maneuver through the accelerated earth changes. As cities throughout Asia increase in population density, increase in busyness, noise, financial abundance, it seems the desire to share the small apartments with animal companions increases. Why is this I pondered. My feelings are that with increased emphasis on financial success, a super efficient, multi-tasking mind stream, never-ending to do lists, the heart continues to shut down. The stress with other families members heightens and the one and only place one’s heart can receive solace, comfort, loving kindness and compassion is from our kindred spirits, dogs, cats, and other animals that we can share our homes with. I hear this over and over again wherever I travel to teach and share about the human animal bond and integrative animal health care. With the increase in the number of companion animals, veterinary medicine, pharmaceuticals, pet foods, supplements, new, innovative diagnostic and therapeutic modalities also are on the rise. The quality of veterinary care improves and inadvertently so do the costs. The dance between quality and expense must be continually evaluated and balanced based on the financial ability of the human caretaker and the life of their animal. The questions inevitably arise such as what price is too much to save an animal’s life. There is no black and white answer to this and it varies from patient to patient, human to human, situation to situation. This can be an emotional roller coaster for the veterinarian as well as clients. It is then an opportunity for veterinarians to keep an open, compassionate heart in the midst of economic realities. Not always easy. One partial solution that I lecture on is the benefit of integrative animal health care and true prevention through proper, healthy, natural, balanced, nutrition along with appropriate nutritional supplements. In addition, the importance of regular exercise and heart to heart, loving connections that both help support a healthy immune system, thereby preventing disease and expensive intervention. These messages seem to reverberate well with most veterinarians, whereby they often have an “aha” moment on how these holistic preventive measures are truly the essence of health and happiness for all beings. These messages seemed to especially resonate with the veterinary students that attended my lectures and I interacted with afterwards. 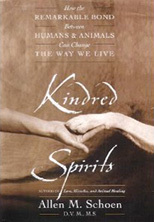 The Korean veterinary students reminded me that my last book, “Kindred Spirits, How the Remarkable Bond Between Humans and Animals Can Change the Way We Live”, had been translated into Korean and shared how it nourished their souls as they worked their way through the academic rigor of veterinary studies. As four idealistic and excited veterinary students proudly showed me around their beautiful island, Jeju, the Island of Peace, as it is known, I was able to guide them through different mind/body exercises and meditations that might help them balance their lives as they entered this noble, yet challenging profession. We sat by the beach, by waterfalls and discussed how natural health care, mind body medicine, loving kindness and compassion can be integrated into modern conventional medicine and surgery. It was nice to see, that these messages were so well received by new up and coming veterinarians, the future of veterinary medicine and health care. In addition, I was happy to hear from professors at Korean and other Asian veterinary schools how my textbook, “Veterinary Acupuncture, Ancient Art to Modern Medicine” was used as the essential text on Veterinary Acupuncture throughout the region. 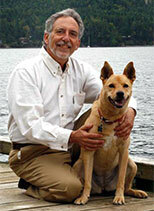 After taking a self-created six month sabbatical from teaching, writing and veterinary practice, it was heartening to see that veterinary students and veterinarians throughout the world are continuing to recognize the importance of natural health care and the human animal bond in the healing of the world as we all meander through these intriguing global changes. Loving kindness and compassion through the support of our animal companions are essential in the planetary re-adjustments and healing.